Whether you’re looking to explore new cultures, undertake an epic gap year adventure or work overseas in an unfamiliar environment, Objective Travel Safety can equip you with the tools to identify indicators of trouble early, so you’re able to anticipate and avoid danger. We’re much more than a travel advice website , and we offer a range of training courses, such as those for business travel & NGOs, Leisure & Adventure, Gap Year Safety, Urban, Corporate and Hostile Environment Safety. Having been providing training since 2003, we have a range of consultants who assist us in the delivery of training and the provision of security advice. No matter where you’re travelling to, safety and security will be of significance, and our courses are accessible to all types of individuals working or exploring a variety of environments. We always tailor our courses to our clients needs, covering all areas of security to minimise risks, but some of our more general topics may include accommodation security, kidnap prevention, situation awareness, criminal activity and handling of corrupt officials. We know that the needs of a young 18-year-old gap year traveller going to South East Asia for the first time will be very different to those of a reporter working in a conflict area, so no two courses are ever the same. A typical Hostile Environment Safety Course for an NGO or media team might be a two-day course held at our training centre in Northamptonshire, or for larger groups at Oxon Hoath near Tonbridge in Kent. 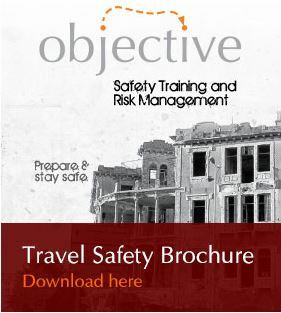 You can learn more about our training on our travel advice website, whilst our downloadable brochure goes into further detail on how Objective Travel Safety’s bespoke courses can help you stay safe. We started covering courses for Media teams in 2002, as it was clear there was a need for journalistic focus in Hostile Environment Awareness Training (HEAT). As a result, Robert Adams, once of Frontline TV and a print journalist and television cameraman for over 20 years, joined the team and has been at the forefront of designing courses for both camera and print media ever since. We currently have a contract with the European Broadcast Union, and have run courses for most of the UKs print and TV media, including the BBC, FT, European Broadcast Union, Daily Telegraph, Daily Mail, Mail on Sunday, Channel 4 and Trinity Mirror Group to name a few. Whilst our team is small, we ensure that our training and advice is delivered by high quality personnel who have extensive knowledge of global security and overseas travel. Our advice is tailored for you, taking your destination, experience and type of activity into account, whether that’s business travel, Leisure & Adventure or Hostile Environment. You can read more about us on this travel advice website, but for any further information on our courses, please do not hesitate to give us a call on 01788 899 029.